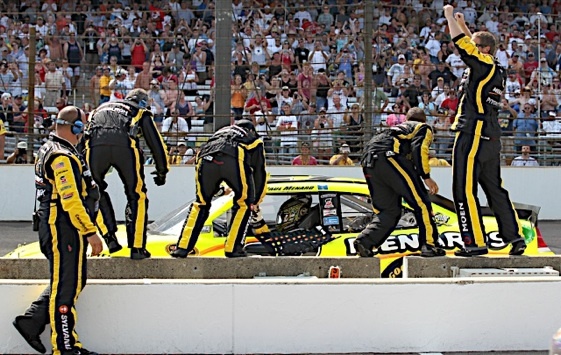 Menard held off a charging Jeff Gordon over the final laps of Sunday’s Brickyard 400 at Indianapolis Motor Speedway and crossed the finish line .725 seconds ahead of the four-time winner of the event. And then he got emotional. Regan Smith finished third, 2010 winner Jamie McMurray was fourth and Matt Kenseth was fifth. Rounding out the top 10 were Tony Stewart, Greg Biffle, Mark Martin, Brad Keselowski and Kyle Busch. To get the victory, Menard had to squeeze 35 laps out of his final fuel load. And, equally daunting, he had to hold off a fully fueled Jeff Gordon, who appeared to have the fastest car in the field Sunday. The first of those being Gordon. Kasey Kahne took the lead away from polesitter David Ragan on the first lap and quickly began pulling away from the field. By lap 10, Kahne had a 3-second lead and by lap 15 the lead was 4 seconds. When the first round of pit stops occurred under green at about 26 laps in, Kahne not only cycled through with the lead but increased it to over 8 seconds on Gordon. The first caution of the day came out on lap 33 for debris. Leader Kahne and second-place stayed out while many others in the top 10 came in. When the race went green again on lap 39, the Hendrick cars of Gordon, Jimmie Johnson and Mark Martin were lined up behind Kahne. On lap 50, the caution came out again when David Reutiman hit the wall. During the ensuing stops, Kahne fell to ninth place after having a lugnut snafu. Taking over the lead was Dale Earnhardt Jr., who had pitted just before the caution to have his grill cleaned and stayed out under yellow. Second was Ragan, who opted for just two tires. After the race went green on lap 54, Earnhardt held the lead on his older tires until lap 60 when he was passed by teammate Gordon on the back stretch. On lap 67, Johnson passed Earnhardt for second but Hendrick cars continued to run 1-2-3 with the Roush Fenway Ford of Kenseth fourth and Kahne fifth but 5 seconds behind. On lap 77, Earnhardt had to pit for tires and he continued to run out of sequence. back in the lead, Johnson was second and Earnhardt was third. Behind the Hendrick trio was Kahne and Kenseth. The third caution of the day waved on lap 94 for debris on the track. When the race restarted on lap 98, the running order was seriously shook up as some teams took two tires and some four. Menard had the lead, Kenseth was second and Ragan was third. Having trouble in the pits was Stewart, who was pitting as Kyle Busch was leaving his stall. Both needed long stops to reshape bent metal. Also, Johnson was sideswiped by Brian Vickers and fell out of the top 10. On lap 105, Kenseth passed Menard for the lead. Gordon quickly shot past Menard and for the next several laps, Gordon sat on Kenseth’s rear bumper. On lap 113, the caution on came out after Kyle Busch hit the wall. Brad Keselowski stayed out and inherited the lead. Second was Jeff Burton, who also stayed out. Kenseth, who took four tires was 11th and Gordon, also taking four, was 12th. On lap 120 – three laps after the restart – Landon Cassill spun and Kahne and Menard had to go through the grass to avoid him. The leaders – Keselowski, Burton and Clint Bowyer – stayed out. Ten laps later, en masse green-flag pitting began. On lap 132, Bowyer moved to the lead when Keselowski pitted. Two laps later Bowyer pitted and Gordon had the lead back. Not among those pitting was Stewart. He pressed on and pitted for two tires on lap 145. 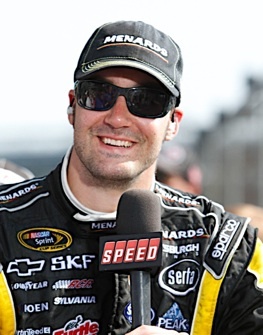 That put Menard back in front. Behind him were 11 others who would perhaps need to pit again. Or, perhaps not, and that turned the race into a fuel mileage event with 15 laps to go. The first car who could definitely make it on fuel was Gordon, who was 12th. On lap 152, Jamie McMurray moved past Menard for the lead. 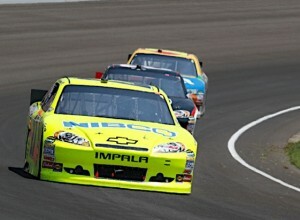 Menard regained the lead four laps later. And from there, the race was between leader Menard, Gordon and Menard’s fuel supply. After the victory, several drivers said the win for Menard would be a popular one in the garages. John Menard was equally emotional about his son’s win.